Dubbed a city within a city, North York has a unique charm being its own brand of multiculturalism. 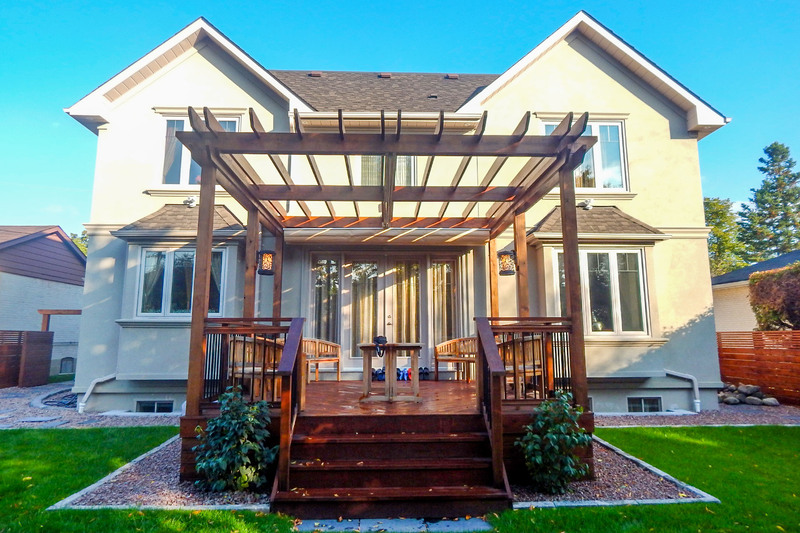 From its university, historical sites and various neighborhoods, there are many aspects of North York that make up the vast portion of Toronto living. When the weather is warm, pristine parks like Mel Lastman Square encourage outdoor relaxation and entertainment. 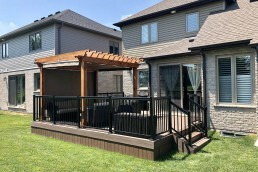 Looking to recreate a similar peaceful outdoor space in their own backyard, these homeowners carved out a raised deck on the back of the house. Topped with a wooden pergola, the deck is surrounded by a well-manicured lawn decorated with concrete pavers, creating pathways around the yard. 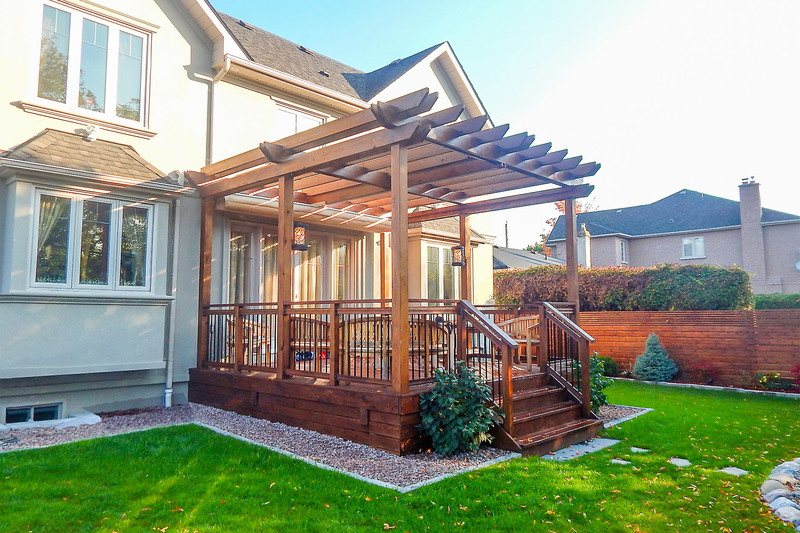 In order to maximize usage of the new outdoor space during the warmer months, the homeowners needed robust sun and rain protection. ShadeFX customized a 16’x14’ motorized shade to attach underneath the wooden pergola. 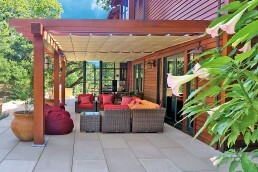 In addition, to keep within the colour scheme, the homeowners chose Top Gun 9 Sand as the fabric for the canopy. 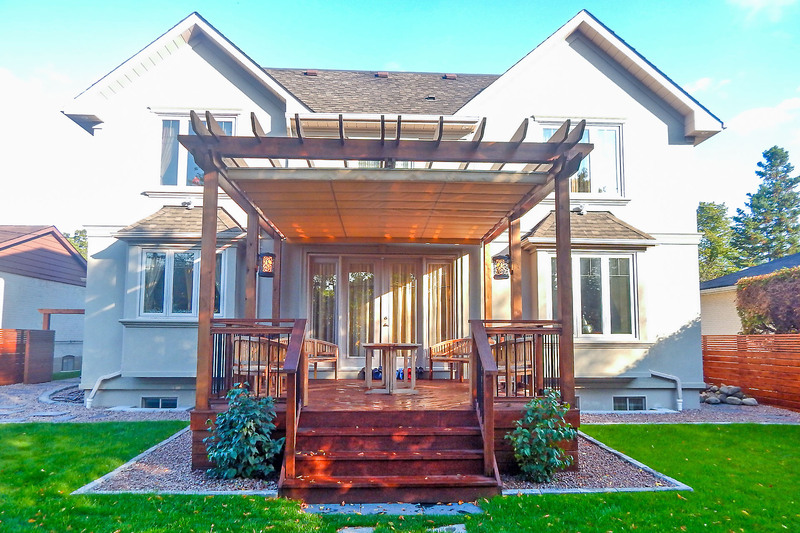 Now, they can easily transition from their living room, through the French doors and on to the deck that sits perfectly between the home’s two bay windows. 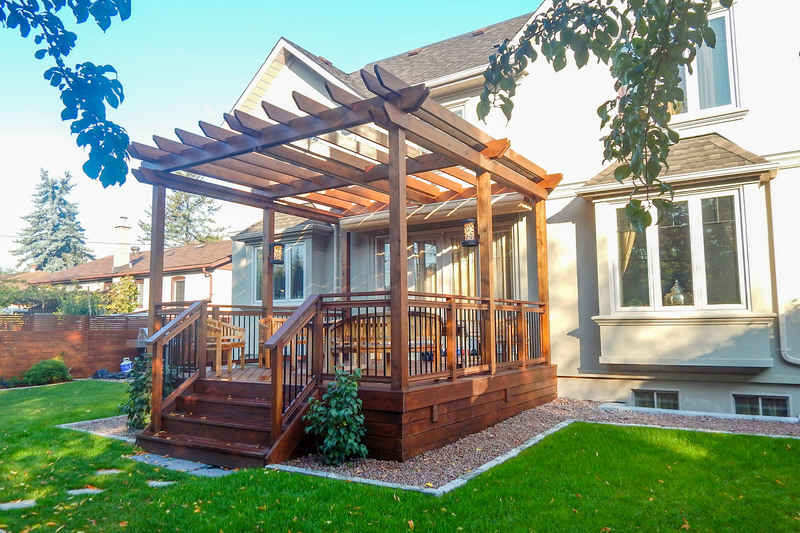 Since the homeowners opted for the motor drive option, they have the power to extend and retract the canopy at the push of a button. This gives them the freedom to move the canopy to the perfect position to block out the sun’s harsh rays. Need retractable coverage at the push of a button? We can help. 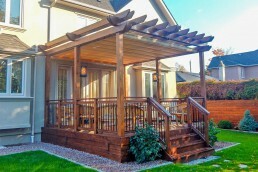 ShadeFX customized a 16’x14’ motorized shade to attach underneath the wooden pergola. The motorized canopy provides abundant coverage, extending and retracting at a push of a button.